According to the Institute for College Access and Success, seven out of 10 college graduates have student loan debt averaging $29,400. Making matters worse is that the total cost of college tuition doesn’t account for the interest students end up paying over the life of their loans. The college selection process includes a host of factors, from the right course of study for your student to college tuition that makes financial sense for your family. There is a vast difference between in-state and out-of-state college tuition. If your child wants to attend a college or university in another state, help her compare academics versus cost. If the out-of-state tuition is double what it costs to attend an in-state school, ask yourselves, Is the out-of-state college’s education two times better? If not, it makes the most financial sense for your student to attend an in-state college. When checking tuition costs, keep in mind that the sticker price isn’t always the actual price. As college costs have risen over the past decade, so has tuition discounting. In 2010–2011, the average annual cost (tuition and fees) to attend a private college was $27,290, but the average net price paid was only $11,320. Average in-state tuition at public institutions was $7,610, yet the average price paid was only $1,540. * To find the actual cost of attending a certain institution, check out the online net price calculators found at http://nces.ed.gov/collegenavigator. It’s also important not to rule out a two-year college as a less-expensive stepping-stone for attaining a four-year degree. Community college costs are, quite literally, thousands of dollars lower than the cost of attending a four-year school. Proven success in college-level coursework at a community college can also increase your student’s odds of attending a more selective four-year school and receiving a better financial aid package. Ultimately, what determines your student’s success is not what college or university he attends, but how hard he works once he gets there. Even if your child doesn’t qualify for every AP course at her high school, there are additional ways to take college courses. Check out online or community colleges that don’t require a high school diploma to attend. When your student takes a college class or two during high school semesters, she may build up enough credits to eliminate one semester’s worth of general college requirements. At a large university, one semester of savings can net several thousand dollars. Before signing up to take online or community college courses, make sure the courses are accredited and that the credits are likely to transfer to the college or university of your student’s choice. This will take a bit of homework on the student’s part, both in researching degree requirements and in talking to college admissions counselors. Both private and public colleges offer scholarships and grants to help students with college tuition. There are also numerous college scholarships that are state-sponsored or provided by your local community and other organizations. Searching for scholarships may feel like adding a part-time job to your student’s already busy schedule, but the hours invested in a scholarship search can pay off far better than any other student job. The scholarship search is one part of the college application process that you can complete as a family. Mom, Dad, grandparents, siblings and, of course, the student, can all get involved in searching for scholarships. But don’t do all the work for your son or daughter. Earning a scholarship is ultimately the responsibility of the student. Filling out a scholarship application needs to be treated with the same respect as filling out a college application — and it’s the student’s job to do it. Just as in business, networking is a great way to get information; you and your student will want to start talking to local organizations about what scholarships they offer and what they require of the candidates. 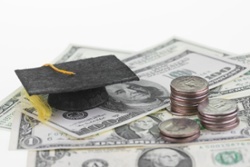 Many companies and organizations offer scholarship programs based on financial need or academic achievement. Your or your child’s grandparents may work for a company that offers scholarships to employees’ families. An organization a family member belongs to may offer scholarships. Organizations at which your child volunteers are other good sources of scholarships. Your religious institution may offer scholarships, too. Your student will need to research the eligibility requirements of each scholarship (yes, you can help with this part). If the opportunities are good matches — and that is essential — he’ll need to request college scholarship applications, then carefully complete and submit them before the deadline. Several paths are available to students who want to work their way through college by working. The Federal Work-Study program provides part-time jobs to students who demonstrate financial need. Other on-campus work options, such as resident assistant positions in dormitories, may offer free room and board or tuition assistance/discounts for a certain number of course hours per semester. If you decide to look for a job off-campus, ask employers if the company offers educational benefits, and if so, what the eligibility requirements are. For example, Starbucks recently made news with announcement of its College Achievement Plan, which offers full tuition reimbursement for undergraduate courses taken through Arizona State University. Again, your student should make sure any courses she takes will transfer to the college or university of her choice. Another option is public service that pays you back. For example, AmeriCorps — a federal service agency that puts Americans to work for nonprofits, schools, public agencies, and community and faith-based groups across the nation — offers education benefits that can help pay for college. Some college majors that lead to public service also may qualify your student for education benefits. For example, education majors may qualify for student loan forgiveness programs offered through the federal government, states, and local communities if they choose to teach for a certain number of years in an underserved community. These are just a few ways to help lessen the load of student loan debt, but the above options aren’t always feasible for every student. If your family must go the route of a student loan to help pay for your child’s college tuition, think about what his or her starting salary will likely be after graduation. A good rule is to aim for student loan debt to be less than your child’s starting salary for one year. Keeping debt in sync with income means your child should be able to pay back his or her student loan in 10 years or less. * “Tuition Discounting,” Association of Governing Boards of Universities and Colleges, Web, 30 June 2014, http://agb.org/knowledge-center/ briefs/tuition-discounting.